"This is the second stop-motion animated feature from Laika, the Oregon studio that produced 'Coraline' (2009), which was directed by Henry Selick and based on the Neil Gaiman novella. 'ParaNorman' comes with somewhat less familiar brand names: Sam Fell, who shares directing credit on 'ParaNorman' with its screenwriter, Chris Butler, helped direct both 'Flushed Away' (from Aardman Animations, the British home of Wallace & Gromit) and 'The Tale of Despereaux' (from Universal Pictures). Like the Aardman movies, 'ParaNorman' was made with physical puppets and sets, and an almost tenderly stubborn insistence on the human touch. Computers figured into its production, as they do on virtually every movie made these days, but an enormous amount of handiwork was also involved, effort that’s visible, for instance, in the meaningful lopsidedness of Norman’s nostrils and ears." 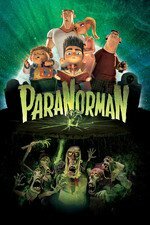 "In fact, though many might see it as a kids film, ParaNorman actually offers better directorial technique than a lot of today’s live-action films – certainly better than almost anything currently offered in the horror genre. It’s not often you find an animated film that has this level of intricate design in regards to angling, lighting, and scene composition; this movie does all that while also fitting in multiple homages to the styles and techniques of famous horror films/directors. If you’re a buff of the genre (or even a causal fan), there are plenty of fun Easter eggs for you to crack while watching." Jim Vejvoda, IGN: "The voice cast – which also includes Casey Affleck, Bernard Hill, Jodelle Ferland and Tempsett Bledsoe – are all solid, especially Smit-McPhee as the title character; whose scenes with Ferland are especially heart-tugging. Bottom line, ParaNorman is one of the best films of the year, animated or not." I was also kind of amazed that the stereotypical dumb jock kid turned out to be sympathetic, instead of a bully... and even more surprised when he turned out to be gay! That is a big deal, for one of the main characters in a kids' movie to be gay. They get you rooting for this kid through the whole movie, he's one of the gang and he's brave and he has a good heart... and then at the end, they casually slip in that he's absolutely, unambiguously gay. That is a big, beautiful F-you to all the right people. ParaNorman is a really terrific movie. I might have to watch it start to finish since it's Halloween. My daughter fell in love with the movie at age 4 (a little young, I know) and still really likes it. I actually thought it was a super innovative CGI film for a long time and was surprised to find out that it uses primarily physical means to create the imagery. I think the film is great even if you're not a horror buff (I certainly am not). Now that I think about it, this is a superb example of American folk horror, from the witch trial to the fact that the small community has become deformed by the son of its past. I shall have to watch this again; I loved it the first time I saw it. This movie makes for an interesting comparison with Monster House, I think-- both feature groups of kids who face a malevolent supernatural entity, and the 'monsters' turn out to be, respectively, a woman and a little girl who were treated like monsters in life and who were warped by their own rage and fear after death. But in Monster House, though there's a few moments of sympathy for the ghost and it's clear her husband still loves her, the kids stay focused on destroying the house and I don't think they really ever understand her. Whereas ParaNorman goes a lot farther in recognizing that there are no real monsters in the story-- not the little girl, and not even the people who killed her. They were all flawed and complex people who made mistakes and felt guilt, and they weren't really any different from the modern-day people in Norman's life. ParaNorman had one of my favorite trailers of the last few years: link. I enjoyed it, but I think that, when I was watching it, I was hoping for something a bit more Nightmare Before Christmas-y celebrating Halloween and witches and ghosts, and not an actual study on how fear and rage can warp people and cause problems even centuries down the line. I'm not saying I didn't like it, because I did, but I think that if I watched it again, I'd like it more, just because I'm not expecting more ghostly adventures.